Following on from the previous joint publications, this new edition of EAU 2004 contains the safety concept with partial safety factors in accordance with the Eurocodes or the European prestandards as well as with corresponding German standard. The recommendations continue to satisfy the requirements for international acknowledgement and application with regard to planning, design tendering, the awarding of contracts, building and building supervision. Since 1949 the "Committee for Waterfront Structures" has operated on honorary base as a committee of the Society for Harbour Engineering (HTG), Hamburg, and since 1951 also as working group of the German Society for Geotechnics (DGGT), Essen. 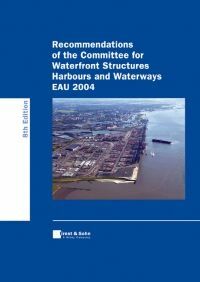 Its full designation reads "Committee for Simplification an Standardization of Calculation and Construction of Waterfront Structures", which also outlines its goals.